Maksekeskus is a payment gateway to collect payments from the Baltics and Finland. With Maksekeskus, you will be able to offer bank link payments as well as accept Visa and Mastercard debit and credit cards. This help article will guide you to enable your customers to complete purchases using Maksekeskus! To offer payments with Maksekeskus, you will first need to have an account with them. You will have to visit their website to submit your application. To start the process, submit a membership application to Maksekeskus. Once it has been received, Maksekeskus will contact you to complete the application. In order to configure your store to accept payments with Maksekeskus, you will need to copy data between both your ShopRoller account and your Maksekeskus account. In your administration view, click on ADDON, and open PAYMENT METHODS. Go ahead and click on the SET button for Maksekeskus. Payment method applies to all client groups: Check this box if this payment method should be available to all of your shoppers. If you would like to make Maksekeskus only available to select customer groups, un-select this box and check the particular customer groups it applies to. Open your account - which can be accessed via https://merchant.maksekeskus.ee. Copy the Shop ID and Secret key and add them to the respective fields of your ShopRoller account. Since Maksekesus offers a variety of payment methods for your customers, select the types of payments you wish to enable, by checking the boxes in your ShopRoller account. The last step is to copy information from your ShopRoller account to your Maksekeskus account. This URL is needed to direct your customers correctly when making payments and sync status updates. Go back to the API Settings Page of your Maksekeskus account. Congratulations! 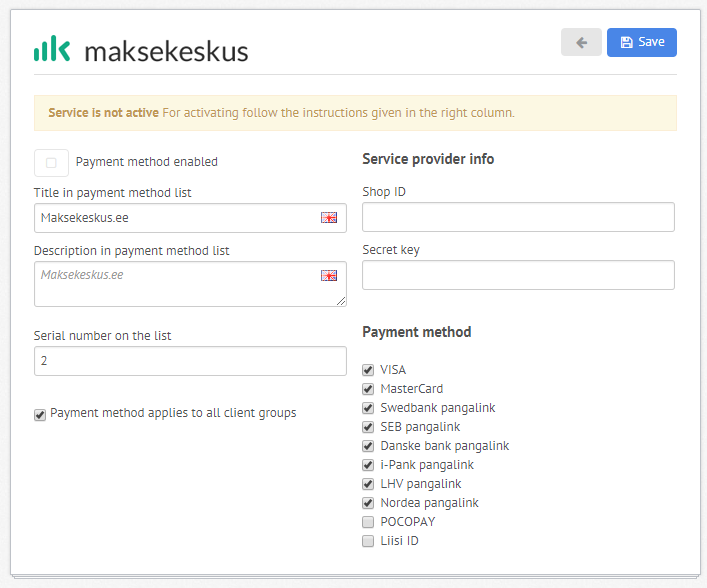 You can now accept payments with Maksekeskus. Here are some frequently asked questions about this topic! Does Maksekeskus have sample data I can use to try? Currently only available in Estonian - however, you can always TRANSLATE PAGE using the right-click menu. Why won't my order status' won't change automatically?